Larcadip : Each film-coated tablet contains Lercanidipine Hydrochloride INN 10 mg.
Larcadip is a selective calcium channel blocker of the dihydropyridine group and it inhibits the transmembrane influx of calcium into smooth muscle. The mechanism of its antihypertensive action is due to a direct relaxant effect on vascular smooth muscle, thus lowering total peripheral resistance. Larcadip is endowed with a prolonged antihypertensive activity because of its high membrane partition coefficient, and is devoid of negative inotropic effects due to its high vascular selectivity. 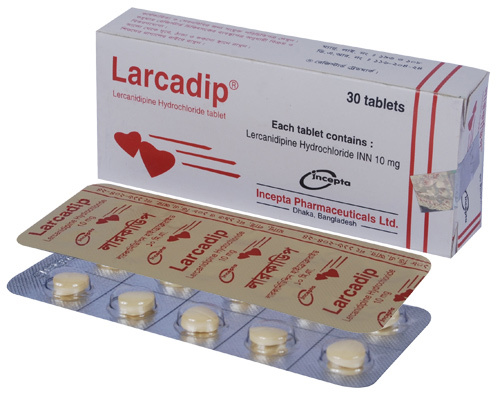 Larcadip is indicated for the treatment of mild to moderate essential hypertension. Use in the elderly: The recommended dosage is 10 mg orally once a day at least 15 minutes before meals; the dose may be increased to 20 mg depending on the individual patient\'s response. It may take about 2 weeks before the maximal antihypertensive effect is apparent. Some individuals, not adequately controlled on a single antihypertensive agent, may benefit from the addition of Lercanidipine to therapy with a beta-adrenoceptor blocking drug (atenolol), a diuretic (hydrochlorothiazide) or an ACE inhibitor (ramipril). Use in children: Since there is no clinical data in patients under the age of 18 years, use in children is not currently recommended. Use in renal or hepatic dysfunction: Special care should be exercised in patients with mild to moderate renal or hepatic dysfunction. Dosage above 20 mg daily must be approached with caution. Lercanidipine is not recommended for use in patients with severe hepatic or renal dysfunction. Treatment with Lercanidipine is generally well tolerated. The most common side effects are related to the vasodilatory properties of Lercanidipine such as flushing, peripheral edema, headache, dizziness and asthenia. Other side effects, which occurred in less than 1% of patients include fatigue; GI disturbances such as dyspepsia, nausea, vomiting, epigastric pain and diarrhea, polyurea, rash, somnolence and myalgia. Special care should be exercised when Lercanidipine is used in patients with sick sinus syndrome, left ventricular dysfunction and ischaemic heart disease. There is no clinical experience with lercanidipine in pregnancy, but other dihydropyridine compounds have been found to cause irreversible malformations in animals. Therefore, lercanidipine should not be administered during pregnancy or to women with child-bearing potential unless effective contraception is used. There is no clinical experience with lercanidipine in lactation. Distribution into milk may be expected, due to the high lipophilicity of lercanidipine. Therefore, lercanidipine should not be administered to lactating women.